At the start of writing this section I was faced with the question “What’s an attribute?”. But a reasonable answer has eluded me, so I will make the assumption that the answer will be something of a compromise :-). I like to think that an attribute of an element is something that is a characteristic of the object without defining it, and/or it may affect the object’s position or orientation on the page. There could be a strong argument to say that the following section on styles could be seen to cross-over into attributes and I agree. However, for the purposes of providing a description of the syntax and effects, I’m happy with the following list :-). Because not all attributes are applicable to all elements, there will be a bit of variation in the type of shapes we deal with in the description below, but there won’t be any that are different to those that we’ve already looked at. There will be some repetition with recurring information from the elements section. This is intentional to hopefully allow each section to exist in its own right. The x and y attributes are used to designate a position on the web page that is set from the top, left hand corner of the web page. Using the x and y attributes places the anchor points for these elements at a specified location. Of the elements that we have examined thus far, the rectangle element and the text element have anchor points to allow them to be positioned. The top left corner of the rectangle is specified using x and y at 100 and 50 respectively. The x1, x2, y1 and y2 attributes are used to designate the position of two points on a web page that are set from the top, left hand corner of the web page. These two points are connected with a line as part of the lineelement. 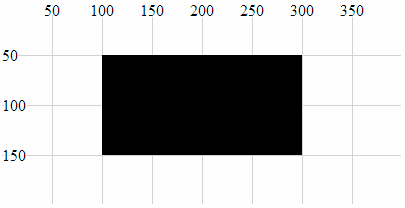 x1: The x position of the first end of the line as measured from the left of the screen. y1: The y position of the first end of the line as measured from the top of the screen. x2: The x position of the second end of the line as measured from the left of the screen. y2: The y position of the second end of the line as measured from the top of the screen. The line extends from the point 100,50 to 300,150. 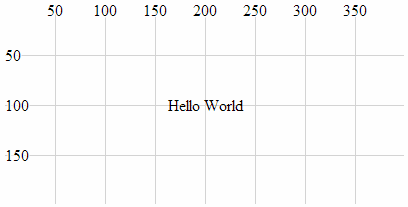 The points attribute is used to set a series of points which are subsequently connected with a line and / or which may form the bounds of a shape. These are specifically associated with the polyline and polygonelements. Like the x, y and x1, x2, y1, y2 attributes, the coordinates are set from the top, left hand corner of the web page. 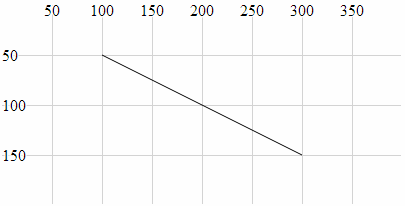 Where 100,50 is the first x,y point then 200,150 is the second. Now is probably the best time to mention that the d3.js wiki makes the point that “it is typically more convenient and flexible to use the d3.svg.line path generator in conjunction with a path element” when describing complex shapes. So while drawing a polyline or polygon using this method may be possible, bear in mind that depending on your application, there may be a better way. The following is an example of the code section required to draw a polyline in conjunction with the HTML file outlined at the start of this chapter. The additional style declarations are included to illustrate the shape better. 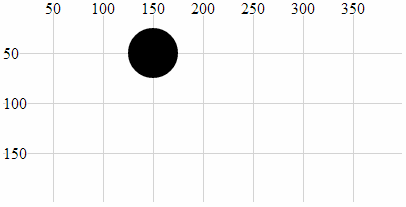 The points values can be compared with the subsequent image. 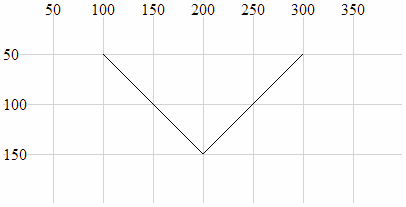 The polyline extends from the point 100,50 to 200,150 to 300,50. The cx, cy attributes are associated with the circle and ellipse elements and designate the centre of each shape. 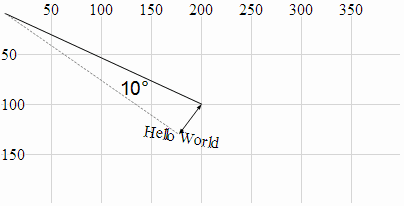 The coordinates are set from the top, left hand corner of the web page. cx: The position of the centre of the element in the x axis measured from the left side of the screen. cy: The position of the centre of the element in the y axis measured from the top of the screen. The following is an example of the code section required to draw an ellipse in conjunction with the HTML file outlined at the start of this chapter. In it the centre of the ellipse is set by cx, cy as 200, 100. 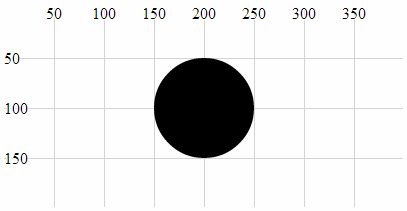 The centre of the ellipse is at x = 200 and y = 100 and the radius is 50 pixels vertically and 100 pixels horizontally. The r attribute determines the radius of a circle element from the cx, cy position (the centre of the circle) to the perimeter of the circle. 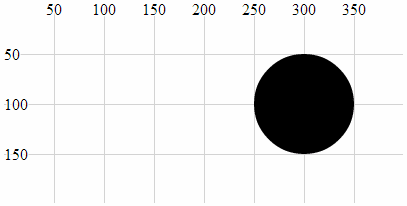 The centre of the circle is at x = 200 and y = 100 and the radius is 50 pixels. The rx, ry attributes are associated with the ellipse element and designates the radius in the x direction (rx) and the radius in the y direction (ry). rx: The radius of the ellipse in the x dimension from the cx, cy position to the perimeter of the ellipse. ry: The radius of the ellipse in the y dimension from the cx, cy position to the perimeter of the ellipse. The following is an example of the code section required to draw an ellipse in conjunction with the HTML file outlined at the start of this chapter. 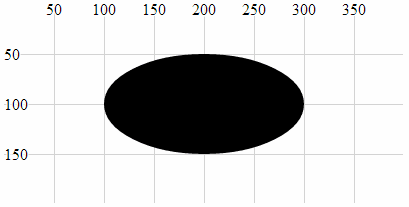 In it, the centre of the ellipse is set by cx, cy as 200, 100 and the radius in the x direction (rx) is 100 pixels and the radius in the y direction (ry) is 50 pixels. The transform attribute is a powerful one which allows us to change the properties of an element in several different ways. translate: Where the element is moved by a relative value in the x,y direction. 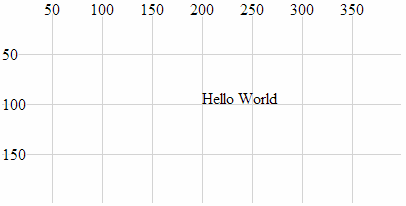 scale: Where the element’s attributes are increased or reduced by a specified factor. rotate: Where the element is rotated about its reference point by an angular value. Without a degree of prior understanding, these transforms can appear to behave in unusual ways, but hopefully we’ll explain it sufficiently here so that you can appreciate the logic in the way they work. The transform-translate attribute will take an elements position and adjust it based on a specified value(s) in the x,y directions. If we add in a transform (translate(*x*,*y*)) attribute for values of x,y of 50,50 this will shift our circle by an additional 50 pixels in the x direction and 50 pixels in the y direction. 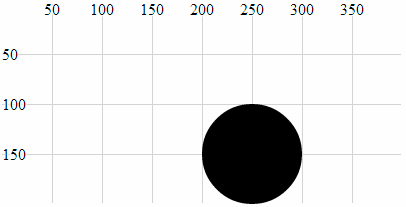 The circle was positioned at the point 200,100 and then translated by 50 pixels in both axes to 250,150. Since by default our starting position is 0,0 if we apply a translation of 200,100 we will end up at 200,100. The translate-scale attribute will take an element’s attributes and scale them by a factor k.
If we now introduce a transform-scale attribute with a scale of 2 we will see all three of the other attributes (cx,cy and r) scaled by a factor of two to 300, 100 and 50 respectively. In this example we can see that the position (cx, cy) and the radius (r) have been scaled up by a factor of 2. The translate-rotate attribute will rotate an element and its attributes by a declared angle in degrees. Obviously the text has been rotated, but hopefully you’ll have noticed that it’s also been displaced. This is because the transform-rotate attribute has been applied to both the text element (which has been rotated by 10 degrees) and the x,y attributes. If you imagine the origin point for the element being at 0,0, the centre, middle of the text element has been rotated about the point 0,0 by 10 degrees (hopefully slightly better explained in the following picture). Which leads us to the final example for which is a combination of all three aspects of the transform attribute. Here we have a text element translated to its position on the page, rotated by 10 degrees about the centre of the text and scaled by a factor of two. 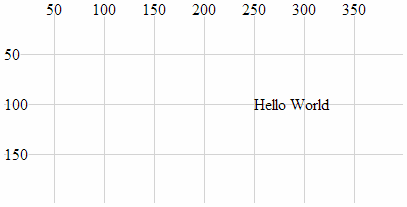 width and height are required attributes of the rectangle element. width designates the width of the rectangle and height designates the height (If you’re wondering, I often struggle defining the obvious). The width of the triangle is 200 pixels and the height is 100 pixels. start where the text is left justified. middle where the text is centre justified. end where the text is right justified. We can demonstrate the offset effect by noting the difference in two examples. 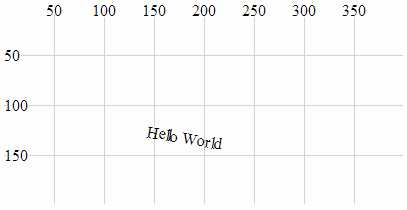 The first is a simple projection of SVG text that aligns the text “Hello World” above and to the right of the anchor point at 200,100 (It does this in conjunction with the HTML file outlined at the start of this chapter.). The second example introduces the dx attribute setting the offset to 50 pixels. This adds another 50 pixels to the x dimension. We also introduce the dy attribute with an offset of .35em. This scalable unit allows the text to be set as a factor of the size of the text. 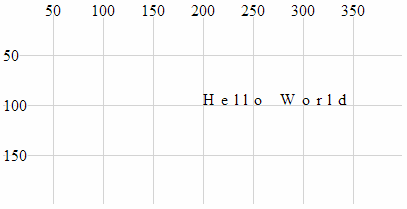 In this case .35em will add half the height of the text to the y dimension placing the text so that it is exactly in the middle (vertically) of the 100 pixel line on the y dimension. The text has been moved 50 pixels to the right and half the height of the text down the page. The textLength attribute adjusts the length of the text to fit a specified value. 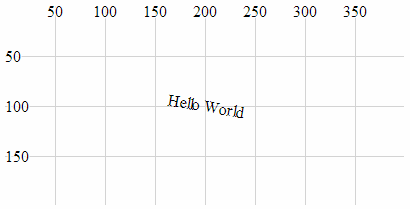 The following is a code snippet that prints the text “Hello World” above and to the right of the anchor point at 200,100 (It does this in conjunction with the HTML file outlined at the start of this chapter.). 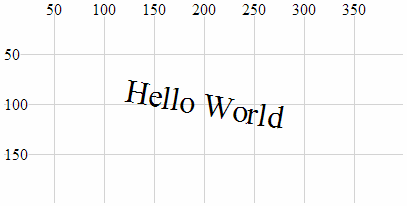 The addition of thetextLength attribute declaration in the code stretches the “Hello World” out so that it fills 150 pixels. It is worth noting that while the text has been spread out, the individual letters remain un-stretched. Only the letter and word spacing has been adjusted. However, using the lengthAdjust attribute can change this. spacing: In this option the letters remain the same size, but the spacing between the letters and words are adjusted. spacingAndGlyphs: In this option the text is stretched or squeezed to fit. The attribute can be best illustrated via an example. The following code snippet (which works in conjunction with the HTML file outlined at the start of this chapter) shows three versions of the text element. The top line is the standard text. The middle line is the textLength set to 150 and the lengthAdjust set to spacing (which is the default). 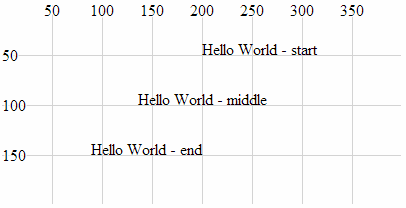 The bottom line is the textLength set to 150 and the lengthAdjust set to spacingAndGlyphs. 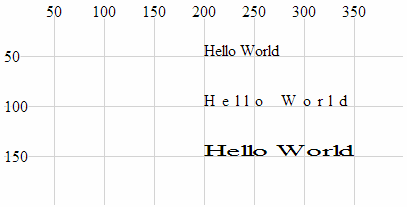 The image shows that the top line looks normal, the middle line has had the spaces increased to increase the length of the text and the bottom line has been stretched. Very Nice post. The examples are very helpful. Very nice post. Appreciate your time and effort.